Last week I was invited by Girls In Tech to facilitate a workshop teaching intermediate web development skills in Python. This event was a collaboration with Python Charmers and I co-facilitated with Ed Schofield. The participants were a fantastic group of women from the industry, it was great to get a chance to help transfer knowledge to the next generation in the industry. 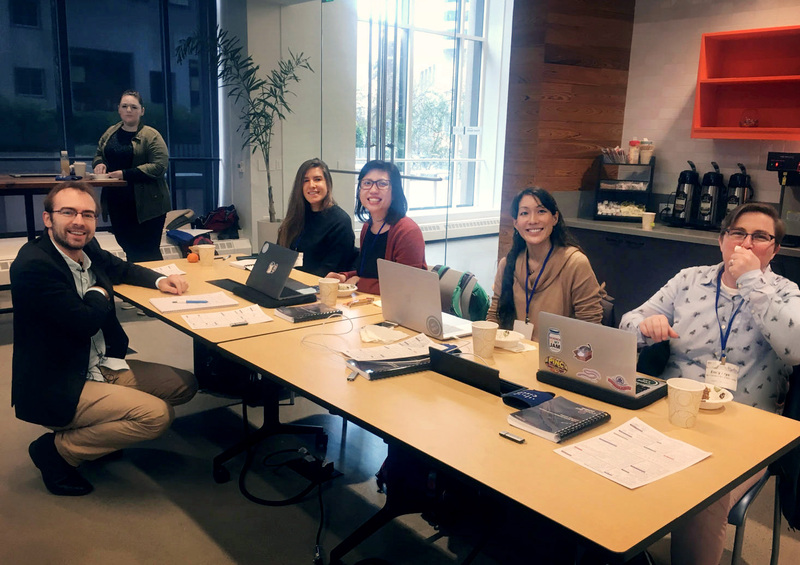 This was a week long workshop at the AWS Loft space in downtown San Francisco, the event site was great and we had a huge amount of support from the Girls In Tech team who did an amazing job of event management and making sure everything ran smoothly. These projects allowed us to work with the students in a real-world project setting and helped bridge the gap between the materials and how to apply them in practice. We ran into a couple of unforseen issues during the event but thanks to our preparations we had the bandwidth free to be able to sort out the issues that arose. One of the main issues was due to attendees bringing in their own laptops, which meant that we had a few issues regarding the differences in platforms. It's an impressive milestone of progress in cross-platform compatibility that things were so smooth, Python with Anaconda distribution does seem to work very well across the major operating systems, even 5 years ago cross platform compatibility was far worse than it is today. I learned a lot in the process of preparing and running this event and I'm very grateful for the opportunity. If you are interested in having me, the Custom Programming Solutions team or Python Charmers put on a workshop or event for your team please let me know. A summary of tech that I have used in 2017 that I found both interesting and valuable. Improvements required to get the MMAP array package on PyPi and make it easy for collaboration.